Non-Slide Crane Stops. 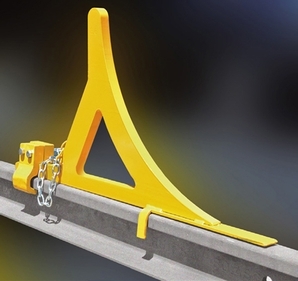 Recommended wherever below rail head clearance is minimal and where a non-sliding crane stop is needed. Wedge dogs lock wedge to rail head and do not interfere with hook bolts. On impact, stops slide only marginally or not at all. Do not use at end of crane run. Wheel Contact Type Centerline of crane bumper should not be more than 12" above top of rail. How to order: Specify wheel diameter. Specify rail size and section.